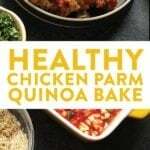 Our protein and veggie-packed healthy chicken parmesan quinoa casserole is a winner for all. 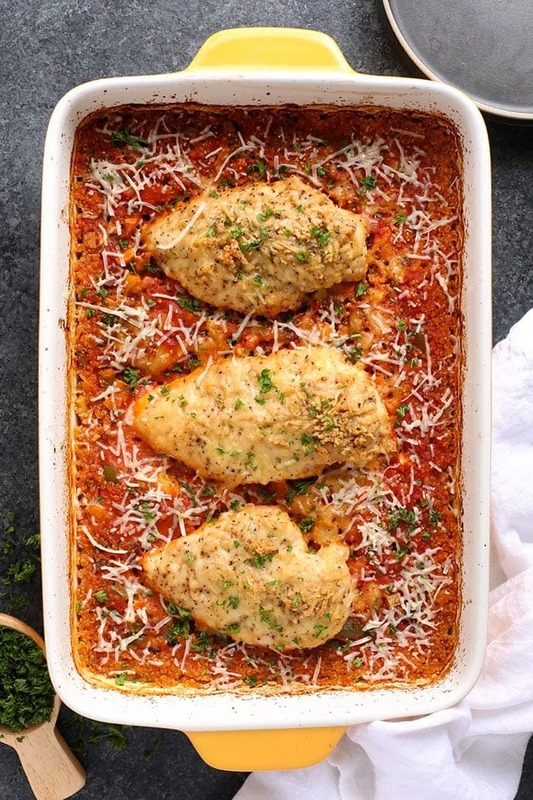 It’s made with homemade parmesan chicken, marinara, mushrooms, and quinoa for an epic, kid-friendly chicken parmesan casserole. 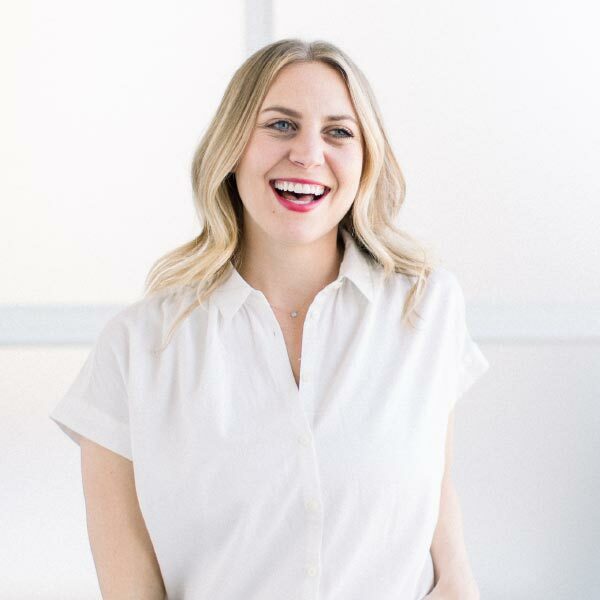 Before we jump into this recipe, can we talk about likes and dislikes of food for a second? I have a VERYYYY short list of foods that I “dislike.” I’m not going to use the word hate because I’m hoping one day my taste buds change. 3 foods on my dislike list and everything else is a thumbs up. I’d say that’s pretty stellar. The reason I bring these three foods up is because Linley convinced me that mushrooms needed to go in the base of the sauce. Obviously I was skeptical, but I was pleasantly surprised that I LOVED the flavor of the mushrooms in this dish and could barely taste their weird texture. 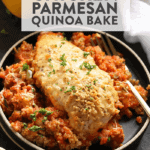 So, if you’re on the fence about this chicken parmesan because of the ‘shrooms, I’m here to tell you that they’re pretty hidden and you’re going to love this parmesan chicken and quinoa casserole. 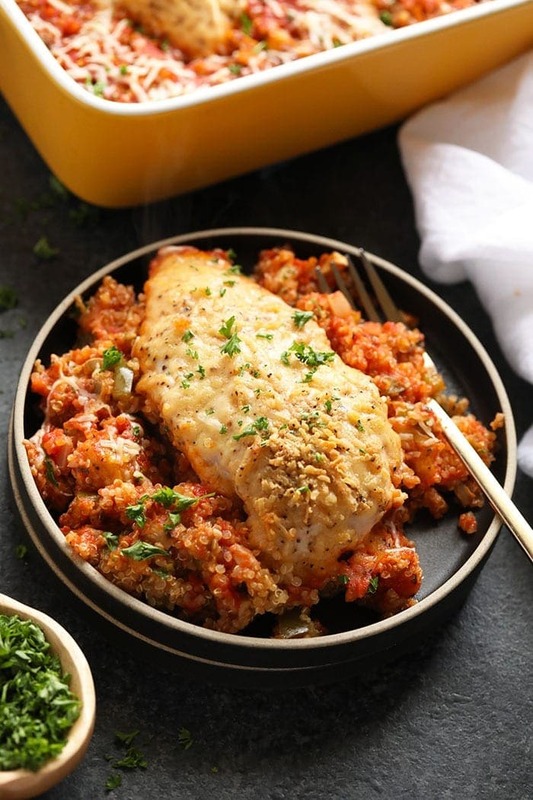 For this healthy chicken parmesan quinoa casserole, you literally throw everything in your ceramic baking dish completely RAW! Veggies, meat, quinoa…everything is raw. Then all you have to do is bake it for an hour. This seriously could not get easier. This recipe calls for onion, green pepper, and mushrooms. Finely dice 1/2 a yellow onion (any color will work) and then chop your pepper and mushrooms into small bite-sized pieces. 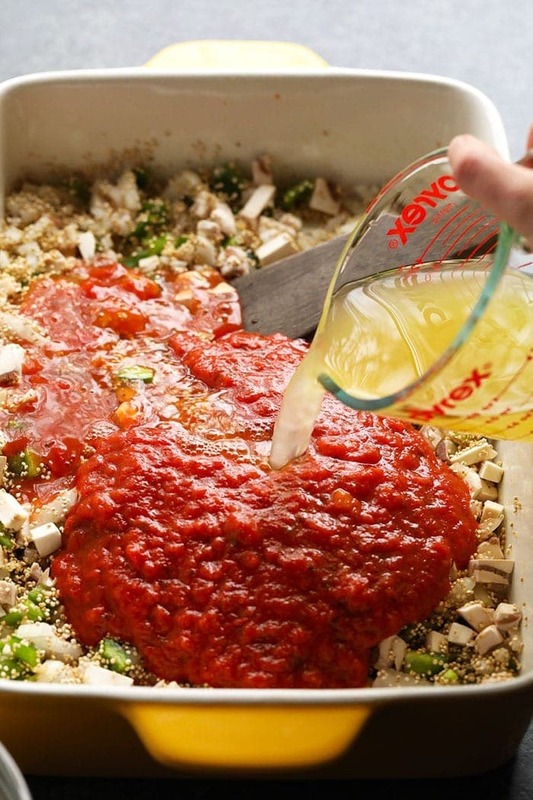 Next, layer your veggies and quinoa onto the bottom of your casserole dish. 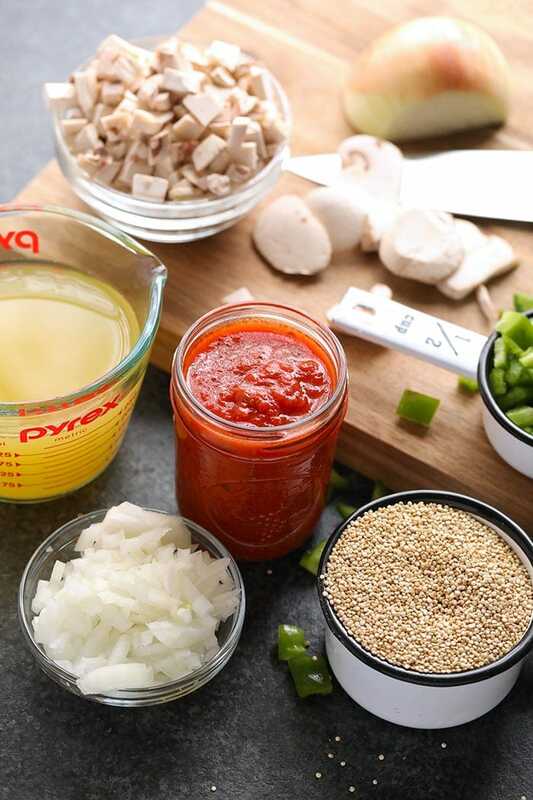 Create the base of your healthy chicken parmesan by adding in marinara and broth. 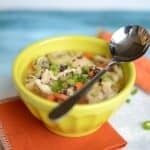 For this step, if you’re hoping to turn this into a vegetarian-friendly recipe, use vegetable broth instead of chicken! 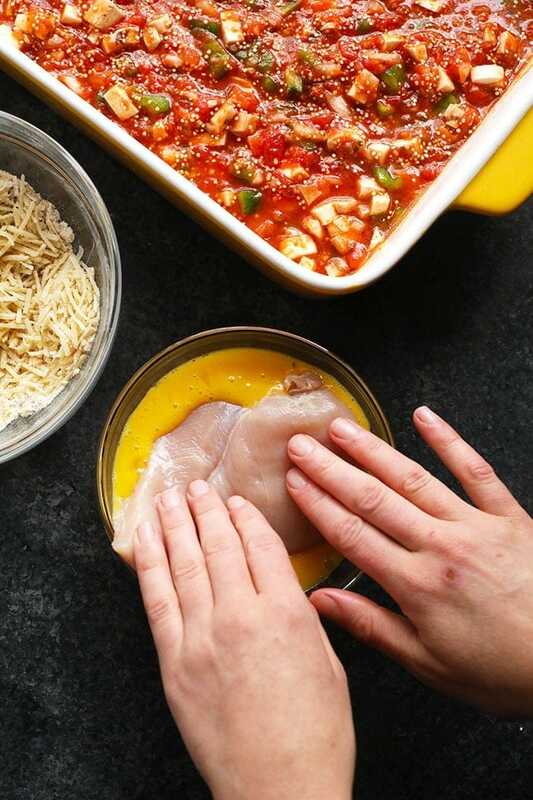 In this step, you’re essentially preparing for baked parmesan crusted chicken. Here, you’ll need an egg wash (1 scrambled egg) and then your parmesan mixture. You can use any kind of flour you want. We’ve tested this with both whole wheat, all-purpose flour, and gluten-free flour. Dip each chicken breast in the egg wash and then right into the parmesan mixture. Make sure to be generous with the cheese part…I mean, the more cheese the merrier! Vegetarian tip: If you’re going vegetarian, slice eggplant into 1/2 inch slices and follow this step just like the chicken. The last step is simple! 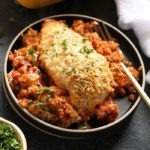 Cover your ceramic casserole dish with tin foil. Then, bake it at 375ºF for 40 minutes. 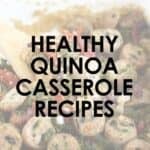 Remove tin foil and bake again for an additional 20 minutes or until the quinoa is fully cooked. 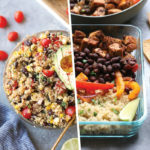 Looking for more quinoa recipes with chicken? Check out some of our favorites below! Preheat oven to 375ºF and spray a 14-inch x 10-inch (OR 9-inch x 12-inch) ceramic casserole dish* with coconut oil cooking spray. Prep veggies by dicing a whole green pepper and 1.5 cups of mushrooms. Finely dice 1/2 a yellow onion. 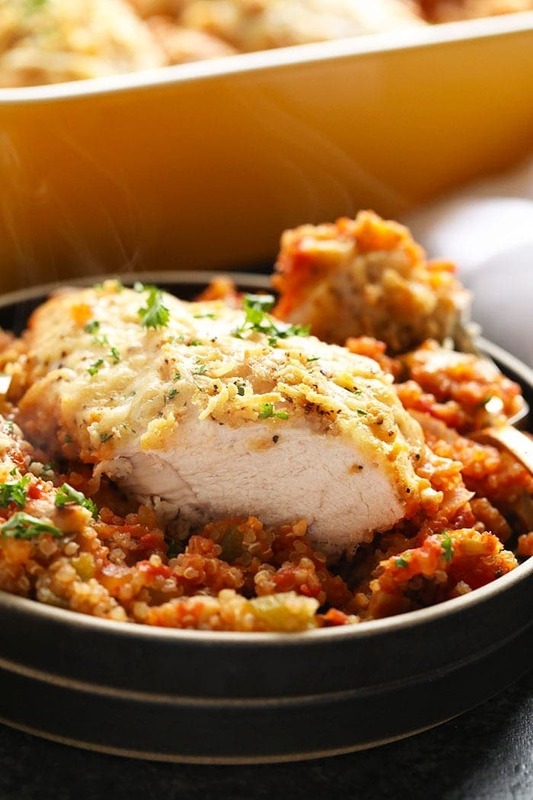 Place 1 cup of uncooked quinoa on the bottom of your casserole dish and then layer on veggies. 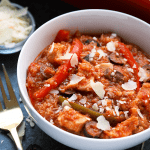 Add 3 cups of marinara sauce, 1 cup of chicken broth, and a tablespoon of minced garlic to the casserole dish and mix everything together. Set aside. In a medium-size bowl, mix together flour, shredded parmesan, and garlic powder. Then, crack an egg into a small bowl and whisk. Finally, sprinkle on the leftover parmesan mixture and even more cheese if you desire. Season with salt and pepper, to taste. Cover baking dish with tinfoil and then bake at 375ºF 40 minutes. 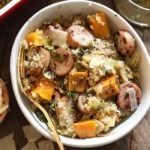 Then, uncover the baking dish and bake for an additional 20 minutes or until quinoa is fully cooked. 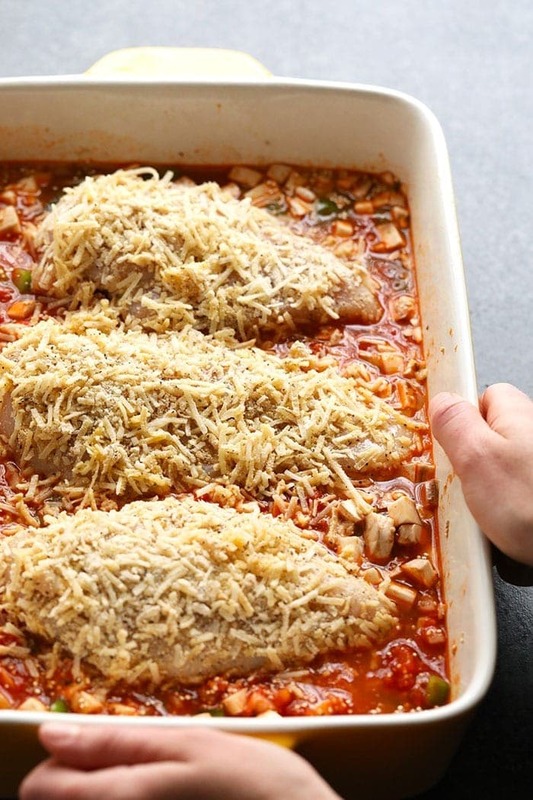 If you are making this recipe, a ceramic casserole dish is going to be your best bet. Ceramic dishes heat your food much hotter than a classic cake pan, so do note this with bake time! PS: here’s the one we have. Vegetarian option: we tested this bad boy with eggplant (at least Linley did..I refused to eat it, okay fine I had a bite) and it was great! If you’re a vegetarian…you are in luck! Just slice your eggplant hot dog way and follow the directions just like the chicken. 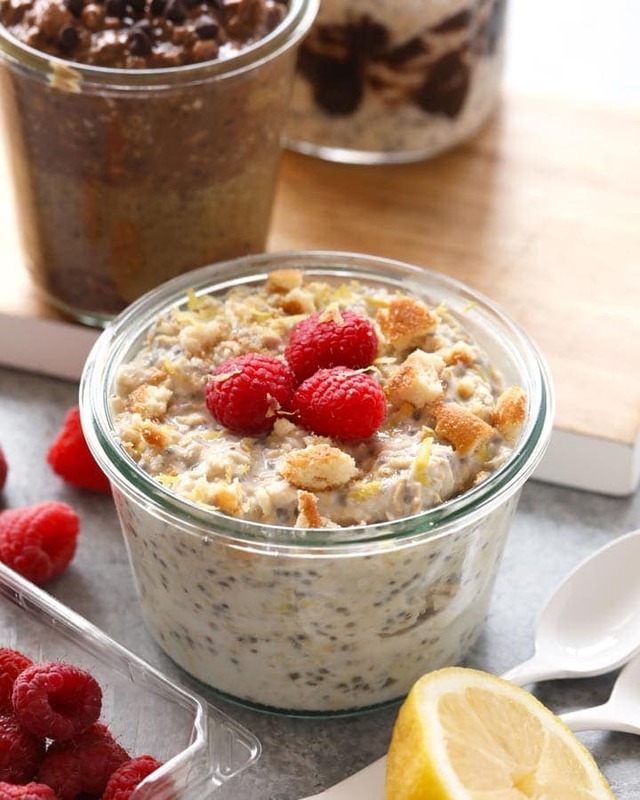 You will still need to bake for the full 60 minutes because that’s how long the quinoa will take to fluff.